It's easy to underestimate the importance of Disco Inferno to progression in music. Emerging at the start of the 1990s they were instrumental in the use of samples, field recordings and snippets of electronic sounds, building collages of noises to supplement the traditional indie guitar, bass and drums set-up. This lead to an experimental and innovative plethora of recordings, which though were critically acclaimed, seemed almost too much out of sync with the prevailing times of Shoegazing, Grunge and Britpop, with which their career ran in an almost alternate universe. The nigh on impossibility to replicate the meticulous planning required for the live environment unfortunately impacted on their longevity and a higher profile and frustrated the band, especially leading to their break up before their third album was released. They arguably they led the second wave of Post-Rock (after Talk Talk and Slint) and their musicianship and ideas have been extrapolated by numerous artists, some of whom cite Disco Inferno as a major influence. The re-issue of In Debt, a compilation of their earliest EPs and their debut album Open Doors, Closed Windows feels like a fitting legacy with the band returning full-circle as their original champion Vinita Joshi, whose Rocket Girl label this re-issue appears on, also ran their original label Che. 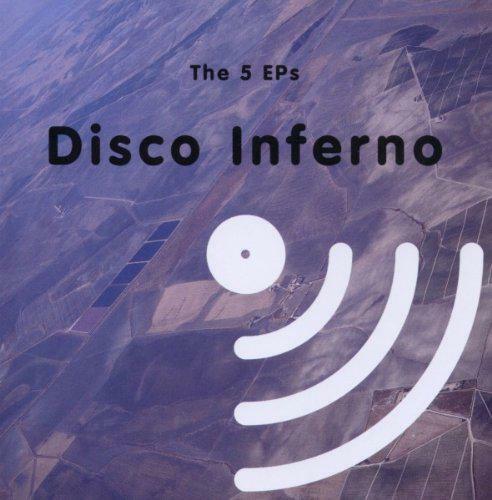 Rather than highlighting Disco Inferno in their prime In Debt points towards their fledgling beginnings which though hints at experimentation, takes more of a primitive and post-punk direction. 'Entertainment' kicks things off, an almost-conventional track. A moody Chameleons bass-line, rappelled trebly guitars, rolling drums and Ian Crause's world-weary vocal take centre stage, with the occasional synth breaking through. A busy song, if not yet full of the kitchen sink instrumentation of later releases, with interesting time changes and a bit more mettle in the guitars during the bridge. 'Arc In Round' adds to the moody atmosphere, led by arpeggiod, choppy guitars, with a hint of a sparse and under-blown Levitation or Young Marble Giants in the rumbling bass. A touch of goth melancholy prevails like a stripped-down Cure or a nod to New Zealand's Children's Hour in it's sparse mentality. The guitar workings show their earliest dabbles into technology, sounding like strings in places. Perhaps unsurprisingly since In Debt dabbles heavily in a post-punk ethos there are clear nods to Wire and Joy Division that lingers in places, especially on 'Broken', albeit in a more up-tempo and optimistic form, the murmuring 'Set Sail' and the desolate and cathartic 'Bleed Clean, however this is far from a tribute album and instead you can see echoes of many tracks in the output of future artists. The glorious 'Interference' has repeated guitar-samples that chug along a la Stereolab, with a hint of Kitchen of Distinction, especially the drumming, in the crescendos. The acoustic but highly experimental 'Hope To God', with Ian's deeply echoed vocal, strummed guitar, flattened drumming and guitar shrills, feels akin to artists such as Hood and Salako. The high-end bass-led 'Waking Up', with it's subtlest of samples, could be a direct influence on Rothko and Billy Mahonie, and the bleak 'No Edge, No End' could easily sit with Interpol's early recordings. The tracks that stand out are the ones that tend to drift away from the set template towards what Disco Inferno were evolving into in later releases. The rollicking 'Freethought' trundles along at 100mph, with thundering drums, coarse and overlaid guitars and a repeated 'guitar' siren sample, leaving very little room to breathe, but is better for it. 'Fallen Down The Wire' maintains the frenetic pace but the guitars feel glacially hypnotic as the drums pound and the plucked bass steer us through the desolate wastelands. 'Next In Line' has repeated chiming guitars, descending bass and a haunting guitar over the top, but opens out with the introduction of siren and summonsing bells samples, and 'new' track 'In The Cold', with it's complete synchronisation of bass and drums, stomps like a Glam or Funk track until accelerating into a manic frenzy as a water sample permeates in the background. However it's 'Emigre' that's the true star of the show, a joyous optimistic song, like Sarah Records with unlimited intelligence, as guitars soar around the track, with just Ian's vocal, a trickle of drums and major-chord bass supporting proceedings. Even when the track fills out with swelling guitars and echoed drumming, the mood remains deeply optimistic. This is the art of making minimalism seem so expansive. Though there is nothing quite as ground-breaking as what Disco Inferno followed with their subsequent EPs, or as bonkers as D.I Go Pop (the track and the album), or as witty as their use of toy instruments to turn Iggy Pop's Lust For Life into a children's theme tune masterpiece, In Debt is a great collection of tracks that showcased a band who were completely on their own, not caring for the prevailing mood at any time of their career, whilst hinting at the innovative and glorious output that was to come.